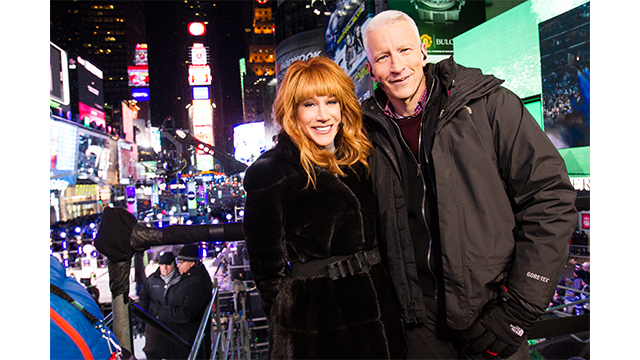 At 12:30 a.m. (ET), Anderson and Kathy will hand off to Don Lemon and Brooke Baldwin who will be counting down as the Central Time Zone rings in the New Year from The Spotted Cat Music Club in New Orleans.Anderson Cooper and Kathy Griffin will ring in 2017 from New York City’s Times Square, along with CNN correspondents reporting from celebrations across the country. Don Lemon and Brooke Baldwin will be celebrating from New Orleans, Richard Quest will report from the energized crowds of Times Square, and Sara Sidner will be in Nashville’s Bicentennial Park for a live interview and performance with country superstar Keith Urban at Jack Daniel’s Music City Midnight. Gary Tuchman will toast from Miami’s famed Fontainebleau Hotel, Randi Kaye will be on board a Royal Caribbean cruise ship and HLN’s Lynn Smith celebrates from a pyrotechnic spectacular at Reunion Tower in Dallas. Leading up to “New Year’s Eve Live with Anderson Cooper and Kathy Griffin” will be “All the Best, All the Worst 2016,” which premieres on December 27th at 9 p.m. (ET), and will re-air on Dec 31st at 7p.m. (ET). The one hour special hosted by Tom Foreman will count down to 2017 by shining a spotlight on the highlights and lowlights of the past year in politics, pop culture, the economy, and entertainment.